Relieving back and joint aches can help almost everyone. 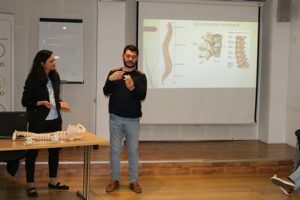 Talk by Dr. Isabel Alzina, Hygeia Center of Medicine, in collaboration with New Acropolis, the C. Idealia Center of Almería and Professor Guillaume Diaz. We reviewed some basic techniques that each person can carry out by themselves, including Digitopuncture and simple massages. Guillaume Díaz, presenting his talk. Illustrated with practical examples, emphasis was placed on the great importance of postural hygiene, in addition to basic general hygiene, moderate exercise, varied and balanced nutrition, and the usefulness of various nutritional supplements. Click here to view another activity on anatomy and physiology.